Revenue management is a critical part of every self-storage manager’s job. Get a fresh approach to rental-rate pricing and learn how a varied, percentage-based increase strategy can reduce move-outs. 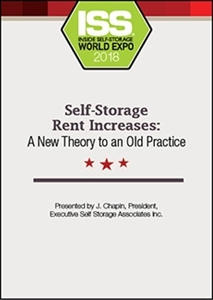 Speaker: J. Chapin, President, Executive Self Storage Associates Inc.
Revenue management is a critical part of every self-storage manager’s job. Our speaker will take a fresh approach to rental-rate pricing, sharing new strategies. He’ll explore the benefits of renting at a lower street rate with a plan for quicker and more frequent increases. He’ll also discuss how a varied, percentage-based increase strategy will reduce move-outs. DVD - Revenue Management for Self-Storage … Are You Getting Your Share of the $32.7B?